When Spain’s Euro 16 squad is picked by Vicente del Bosque this week, Cesc Fabregas will be one of the first names he writes down - irrespective of form for both club or country. Cesc remains a solider for Del Bosque, one who the Spanish coach stays loyal to. It’s been a notable feature in Del Bosque’s era, staying faithful to a particular group, and Cesc is one of them. After all, he’s formed a part of three incredible International triumphs - two of them overseen by Del Bosque himself while the other was when a young fabregas came to the fore under Luis Aragones in 2008. Cesc has shown himself to be everything Del Bosque requires in a squad. The Chelsea man offers experience and familiarity with the squad off the field, while on it he provides experience again but also versatility and general function. 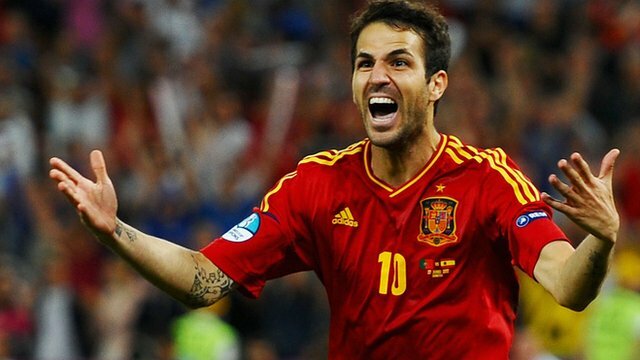 Del Bosque has played Cesc in a variety of roles with Spain, and he’s rarely been let down. Remember when Spain were widely criticised for using the False 9 system? Cesc was indeed that False 9, yet Spain went on to record another triumph that year. The movement of Cesc was vital to Spain’s system, how he operated between the lines and took up positions between the centre backs that allowed others from deeper midfield to move in freely. This time things could be different however given his intermittent form this season. While he may not have a guaranteed starting role, this is a tournament, and sometimes bench players can be as important as starters. Del Bosque is still loyal to a possession based game, but with the caveat of now seeking more dynamism in the area. Hence why he tried to move Diego Costa into the starting XI, albeit with poor results. Cesc then, could be a force from the bench if Del Bosque deems others in a better spell of form. This makes him no less an important component however, and you’d be crazy to bet against the player making some form of impact in the tournament at some point. The primary position for Cesc should he start however would be in the middle of a three behind the striker. There Fabregas could perform his traditional midfield duties of looking to slip passes in between defenders and move between the lines, but also have license to move into the penalty area himself. Cesc remains such a great presence in this sense, with his timing of runs and ability to take up gaps left by opponents. It’s evidently where he performs best, even his former team-mate Thierry Henry explained as much. It’s exactly right. Play him as a deep lying midfielder and his lack of pace is exposed, as opponents can flood attacking players on his position and take advantage. Meanwhile as a centre midfielder, there is probably little room for him in Spain’s team. Koke is the new golden boy there, and could likely be for many years. It leaves the attacking midfield role, and that is just right for Cesc. It will be either there or from the bench that he will feature from this summer. And from there, he can help Spain to yet another triumph.